We were looking at the issues surrounding currency fluctuations for last week's Finance Fridays. This week we are getting the lowdown on the new Facebook Marketplace. If you're an user of Facebook I'm sure you're aware of the local selling groups on there. Essentially they are a way of advertising your unwanted items for sale to people who live locally to you. The groups are free to join and there's no fee required to place your items on there. Also there's no selling fee either. In recent years these groups have become a very popular alternative to selling on sites such as eBay. Now Facebook Marketplace is taking on these groups itself. It's not the first time Facebook has tried to launch such a service with the original Facebook Marketplace appearing in 2007 before it was dropped. Since then Facebook has grown to over 1.7 billion users worldwide with 450 million of them visiting Facebook buying and selling groups each month. Of course Facebook wanted to get involved in this again. Facebook are hoping it will make users spend more on its site and therefore generate more advertising revenue. At the moment it is only available on certain mobile devices in the UK and you need to be over 18 to access it. It was launched in New Zealand about a month ago (thanks to my friend Martyn for the screenshot!) Once the latest Facebook update is available for your phone or tablet you should see in the row of icons a little covered market stall. Here you will be able to find all the items in your local area for sale. Once on the site you can put an item up for sale by uploading a photograph of it and then writing a description of the item. Anyone interesting in buying it can send you a direct message with an offer for it. You then work out payment and delivery details. - You can look at the profile of the seller and determine if they seem reliable and genuine. - No fees like eBay. - Saves posting to multiple selling groups to get local coverage. - Very similar to the existing Facebook selling groups. - No payment facilities so you will need to agree how items are paid for. - No one to sort out any problems such as refunds. 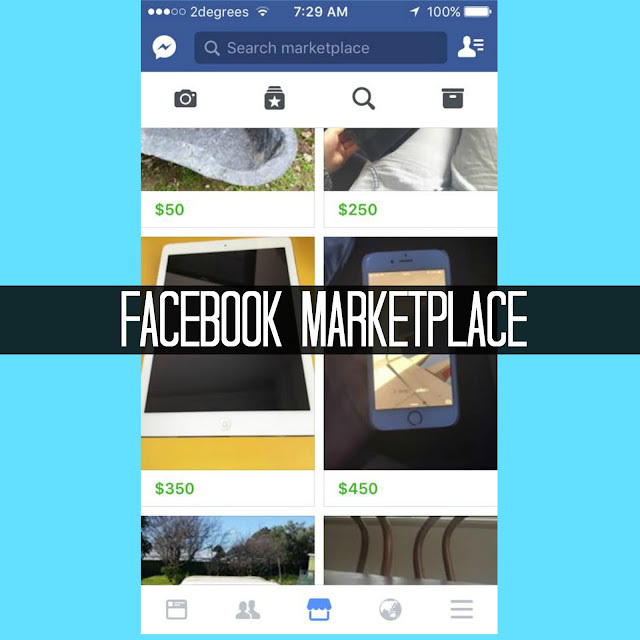 Have you seen the new Facebook Marketplace? Will you be using it to buy and sell items? If you want to join in with this week's Finance Fridays then add your link to the linky below. Any post concerning financial matters is allowed. Full details here. It doesn't have to be published today as you have until 23.55 on Tuesday 25th October 2016 to join in. I have seen it but like Kara haven't the confidence to try it. All I have seen so far is people selling the new £5 notes for 100's of pounds! What's that all about?